One A Day Men’s Health Formula Multivitamins offer a wide variety of key nutrients in a single tablet. 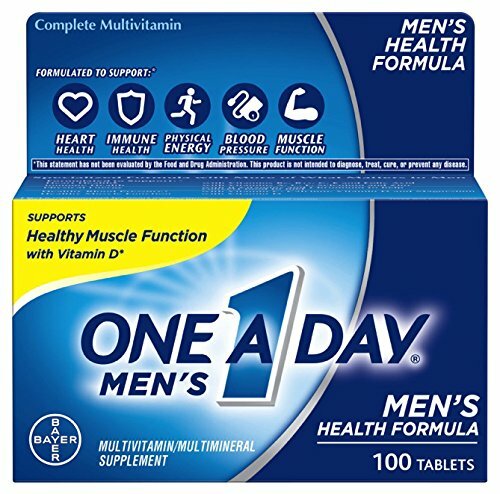 One A Day Men’s Health Formula is ideal for men who are proactive about their health. This daily multivitamin is specially designed to address key health concerns of men. This easy to take tablet contains Vitamins A, B6, B12, C, D, E, and K, Riboflavin, Thiamin, Niacin, Folic Acid, Pantothenic Acid, Zinc, Manganese, Biotin, Magnesium, Copper, Lycopene, Calcium, Selenium, and Chromium. One A Day Men’s Health Formula Multivitamin is formulated to support:* heart health, healthy blood pressure,** immune health, healthy muscle function, and physical energy* by helping convert food to fuel. One A Day Men’s Health Formula Multivitamins are free of gluten, wheat, dairy, artificial colors, and artificial sweeteners. Adult men should take one tablet daily with food. One A Day Multivitamins can provide nutritional support that you and your family may need.